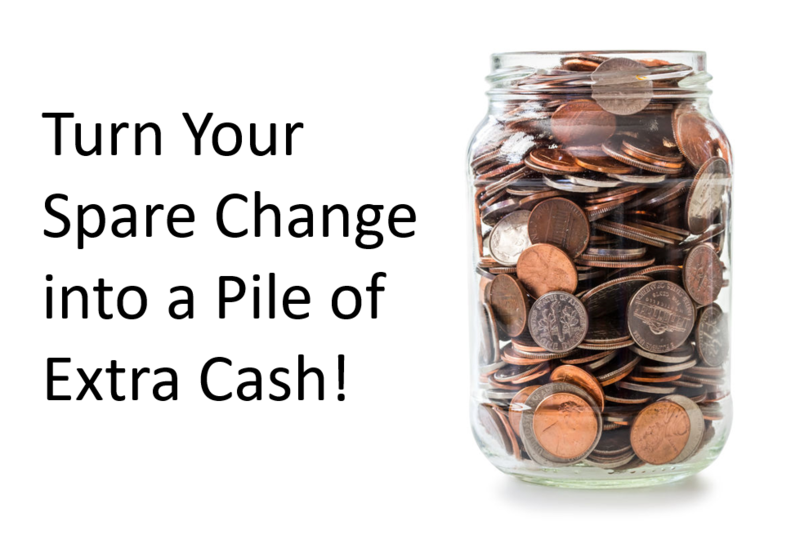 Maybe it’s $100…maybe even $500 into potentially hundreds, even thousands of dollars in as little as 23 days. Hidden around your house are pockets of cash that maybe mean nothing to some…but will mean a lot to you after you read this letter. With just a few clicks of your mouse, this tiny pile of cash could multiply overnight. Suddenly, those stacks of quarters in the basement could fund a trip to the Caribbean. Those wadded up $5’s and $1’s could land you a brand new car. I’m even talking about all that extra cash earning a measly 0.05% in a savings account. Why not turn that into monthly payments for your mortgage. And I admit it will not happen overnight. But with a few simple trades I’ll show you today, you’ll find it could happen in as little as 23 days. Less than a month. Maybe even before the next credit card bill comes due. It’s perhaps the only way to turn almost nothing into something. Something BIG. Fast. All you have to do is follow four trades I’ve mastered over the past 21 years trading options. I know. There are a lot of stigmas out there about options. I’m going to dispel all of them today. Because many folks I talk to, especially those who have never traded a single options contract in their life, feel it’s complicated and risky. I believe options are the “fastest way to get rich” from the markets. Period. If you’re interested to see how… let me show you. Even if you’re skeptical of options or you’ve tried them before, I promise you’ll see them in a whole different light. However, let me be straight with you. That they’re the fastest way to lose money in the markets. Well, I’m not here to give you a ‘come to Jesus’ moment. It’s okay. You can leave your extra cash sitting around and you’ll be the same as you were yesterday. I will say — you’ll never see the full potential of what your money could become. Because — believe it or not — it only takes some extra cash lying around your house to start seeing results. $100…$500…we’re not talking about a lot of money. That’s all you need to earn a few thousand bucks. Take a look at some of my recent recommendations. These are picks from 2018 ALONE. When the markets were in turmoil. The S&P 500 lost 6%. I made these actual recommendations. And, no, these aren’t back-tested hypotheticals. These are real. I believe if an options trader can’t show you multiple triple baggers in one year, they aren’t worth their weight in salt. Let me show you where I come from. You could’ve ended up with as much as $678,906. $500 into $678,906 in less than 10 months. That’s pretty incredible. Now, before we get ahead of ourselves. This scenario would take impeccable timing, not to mention each trade would have to follow the next. I’m not here to promise $678k in 10 months. We’ll have losing trades. Everyone does. But I just want you to have a crystal clear picture at the full potential of what I’ll show you — the huge, massive runway that’s possible if you just have $500 lying around. Most folks work 2,000 hours per year to take home $40,000. That’s before taxes. Meanwhile, you’re about to get an inside look at an opportunity most will never see. You’re still here because you recognize there are ways to make money in the markets you haven’t mastered yet. Well, I promise you can follow my four options trades. If you’ve traded a stock before, you follow a similar approach. A few clicks of your mouse and you’re done. I’ll show you exactly how today. We’re not trying to get rich here, per se. But others may notice a slight change in your lifestyle. You’ll probably feel like a genius mastermind after today. You’re simply adding another way to make money to your arsenal. It costs little to do. It can literally have zero risk. Don’t make any drastic changes to your portfolio. Don’t sell your stocks or liquidate your 401(k). Don’t touch any of your retirement savings. Just scrounge together whatever extra money you have lying around your house, carefully put into a separate account, strap in, and get ready to create an entirely new slush fund. In fact, I’m so confident you can do this, that I’m willing to put it all on the line. This is a promise I stand behind. That means, what you’re about to see is even more a risk-free opportunity for you. If I’m wrong…you still win. I send you more cash to stuff your mattress with. This is a perfect complement to any investment strategy you use for your portfolio. Keep your broker. Keep your financial planner. Keep your stock portfolio exactly as it is. It doesn’t matter. I’m only talking about extra cash you have that’s doing nothing. $100…$500, whatever it is. Like I said, no other asset class lets you start with a small stake…as little as the cash in your wallet…and turn it into thousands quickly. You can’t do that with stocks. You can’t do that with mutual funds. Even penny stocks can take “years” to master according to one of the top traders. Take a look again at a few of my 2018 winners. Tech giant, Microsoft’s stock is up 268% in over 11 years. 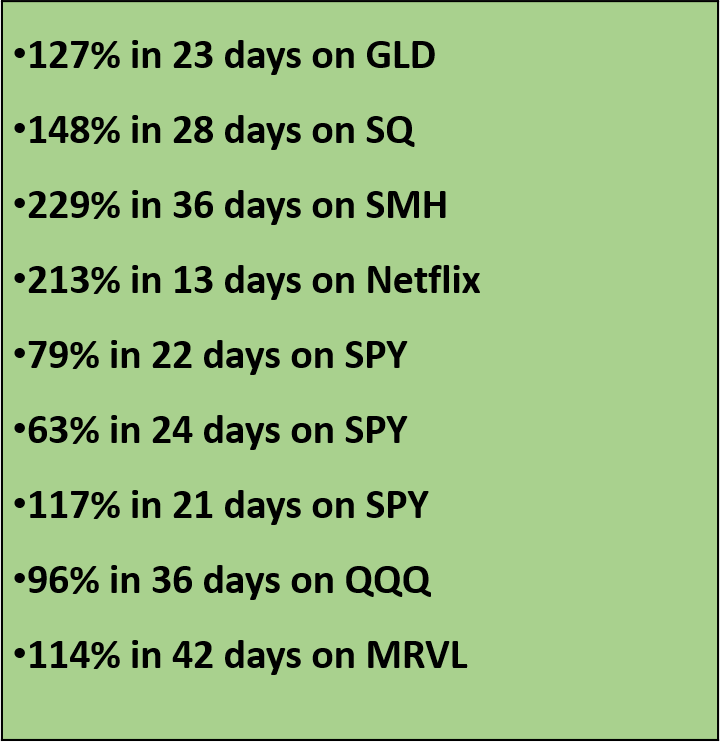 Yet, in 13 days, you could’ve pocketed a 213% gain on Netflix. Yes, it’s less. But you got your money 174X faster. Would you rather make 213% in 13 days or 268% in 11 years? In the past 7 years, Apple stock is up a nice 100%. Would you rather be up 127% on GLD in 23 days or 100% in 7 years? We all want our profits faster. But I was serious when I said this is a ‘new skill’ for you. Because none of this is ‘get rich quick’. It takes timing, patience and following the right strategies. But, if you’re new to the options or it’s been awhile, I want you to feel comfortable putting down a little pocket change. There’s no need to risk money you’ve saved for years. Use the money already around your house. That’s because options are far-and-away cheaper than any asset you’ll find on the planet. Options control 100 shares of stock. 100 shares of Amazon would cost around $160,000. I don’t have $160,000 in my mattress. Meanwhile, a moderate-to-aggressive call option would only cost around $8,000. That’s 95% LESS than buying the 100 shares outright. Now, the options we’d pick up won’t cost $8,000 or even $800. Most contracts we’ll trade will be around $80 – $200 each. A perfect range for that loose change, right? The 127% winner on GLD would’ve cost as little as $101 to execute. The reason the rich get richer is they see their money as soldiers. They send them out into battle and hope they capture and recruit more soldiers to bring home. The more soldiers you have, the easier it is to grow faster. It’s time to put those extra little soldiers to work. Look what you could’ve already captured during the turmoil of 2018. While your 401(k) lost 10-20%, your ‘extra cash’ would’ve mitigated the damage. Again, don’t think I’m suggesting to abandon stock investing all together. I invest in stocks too. But options are my life. They don’t have to be yours. Yet, why not profit from them a few times every 23 days or so. If you’re happy to let your money get dusty, feel free to let the cobwebs fester. My goal today is to show you it’s possible to create a tidy profit with that extra cash lying around your house with options. I’ll show you the four trades to make for free. I’ll walk you step-by-step through how to buy an option from start to finish. I’ll cover every button to press. I know first-hand how they work…because this is behind-the-curtain stuff only professional Wall Street traders see. To prove it, I’m willing to guarantee you’ll 10X your investment or I pay you. 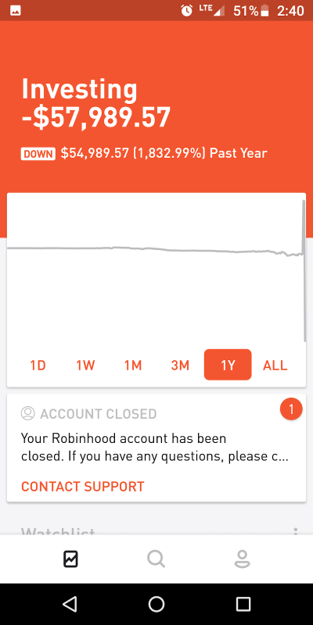 For over 21 years I’ve traded options. It’s my specialty and the only thing I show others how to trade. A multi-million dollar portfolio manager called me “Mr. Options.” He said I was the “expert” at trading them. 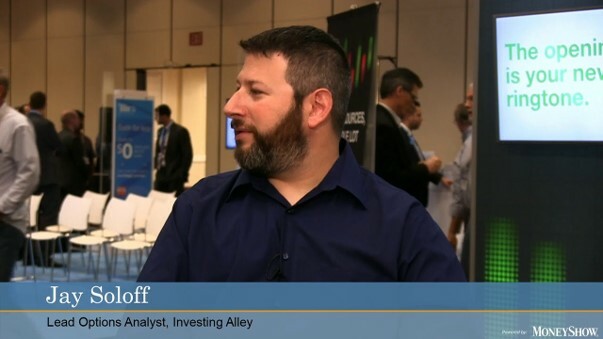 The extremely popular Money Show held each year added me to their “All-Star of Options Trading” panel. I tend to shy away from this kind of flattery. That’s why you won’t find me on the ‘network circuit’ spending my precious hours in front of a camera either at CNBC or Fox Business. I don’t do this for fame or attention. Although, once a year or so you’ll find me giving a talk about options. And it’s not unusual for 500 people or more to attend. But, most of the time, I keep to myself. 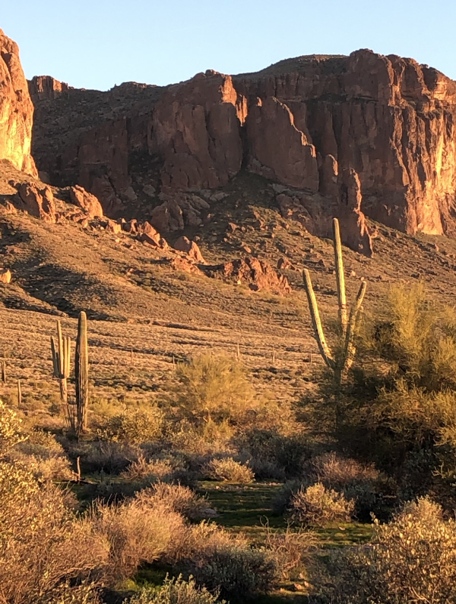 I spend day and night in my Phoenix, Arizona home studying options. This is my view by my house. It’s as “off Wall Street” as it can get. I spend time with my wife and 2 kids, I read fiction books, and browse Twitter. It’s through Twitter I keep in contact with my deepest connections in the industry. I’m talking hedge fund managers of $100 million dollar accounts. I’m talking pro option traders making a fortune from the market. I’m collaborating with them back and forth throughout the week. Twitter gives us the most up-to-date happenings in the market. It’s like my own ‘underground line’ to the trading floor. Some of these connections are new contacts. Others I’ve known since my days on the floor of the CBOE. The CBOE is the Chicago Board of Options Exchange. It’s the largest and most famous options exchange in the entire world. Most options exchanges get swallowed up by them, that’s how dominant they are. Here’s me as a young trader cutting my teeth. Wanna know the fastest way to learn about options? How about running back and forth between traders filling orders and creating a market. 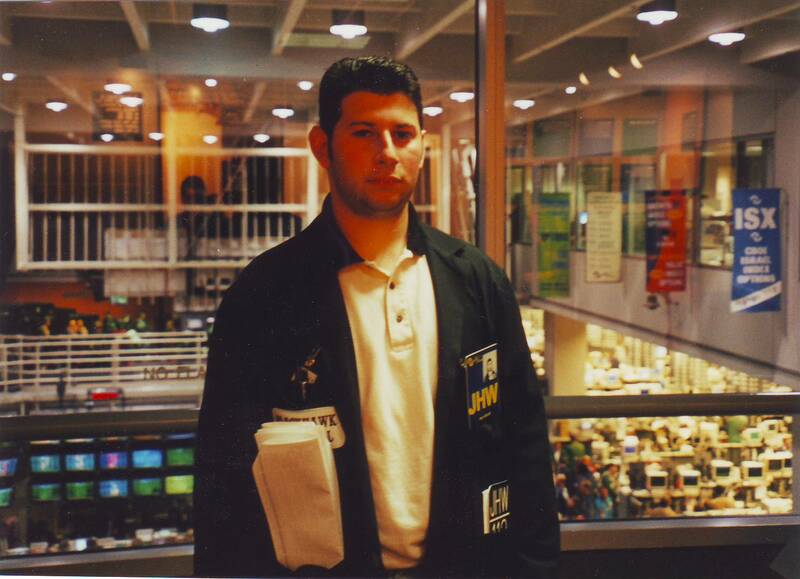 I was a Market Maker at the CBOE. I acted as the ‘‘invisible hand’ that provides liquidity to traders and priced options. If you ever wondered if there was a man behind the curtain pulling the strings of the market, that was me. The whole house of cards sat right in front of me. I helped to build it every day. That means I had information every retail investor would kill to get their hands on. Because as a Market Maker, you know every little thing about the markets. You know what’s causing it to go up and what knocks it down. 90% of options expire worthless. The 10% that don’t…someone knows something. If you’ve lived behind the scenes as I have…you would’ve seen how the 10% are doing it. Honestly, I could write an entire book about what Market Makers do and how you could profit from that knowledge. Because I believe unless you’ve actually seen in person how the options market works, you never get the full picture. Meaning, if you’re a retail investor, you’re at a disadvantage. You’re trading options with ‘incomplete’ information. That’s why it’s time to reveal to you my four trading strategies today. Because there are a few “breadcrumbs” out there that can tip the scales in your favor. For many investors, to find these ‘breadcrumbs’ you’d have to shell out a whopping $3,000/month for a Bloomberg terminal subscription. That’s where I’ve stepped in. Even though I’m over 1,700 miles from the CBOE, I can still read what the markets are doing. For the last 10 years, I’ve been showing readers like yourself how to profit from options. My ‘secret sauce’ is doing exactly the opposite of what the so-called ‘options experts’ are telling you to do. I’ll be even more direct. Many are lying to your face about options. I know because many of them were never professional traders on the exchanges. They never traded millions of dollars for large funds. They just read some books and now teach about it. See, there are two types of gurus in options. The first group claims to never trade options ever. With that advice, you would’ve passed up the triple digit winners I already showed you. With options, you’re controlling 100 shares of stock with one contract. If you buy 5 contracts, you control 500 shares and so on. Leverage can be risky if you don’t know how to handle it. In this story, someone who had no idea how options work set up what he believed to be a “risk-free” options trade. Any time someone tells you a trade is “risk-free” that’s the first sign they have no idea what they’re doing. With no money, he used ‘margin’ — aka a high interest loan — to purchase 2,000 contracts. That means he’s controlling 200,000 shares. In other words, a lot of money. Unbeknownst to him, there was a way for his trade to blow up, and it blew up alright. In 5 days, he had lost over 1,800% and over $57,000 dollars. That’s gambling, and a pretty foolish gamble if I might add. I won’t go into the story’s gritty details as it’s not important. The point is options are risky when you don’t know the rules. I have THREE RULES I’ll share with you for free along with my four trades so you can begin profiting. One of those rules, as a teaser, is managing your risk. It’s the cornerstone of trading. With options trading, you will have losing trades. Even 40-year pros still have losing trades. However, if you practice risk management, you’re able to limit those losses. Compare these tiny losses to the 229%…213%…127% gains I showed you already. And have enough to turn any extra cash you have into a first class vacation to Europe. Risk management hands you the ability to hold onto your cash. That’s what I can show you. Before we do that, let me dispel one more guru lie. Now, I admit. I sell options. A lot of them in fact. They’re a great way to make high percentage, low-profit income. In one of my services, I have a 100% win percentage selling options. Unfortunately, a few hundred bucks isn’t enough to use this strategy. If you’re trading that extra $500 you have, it’s not worth scrapping off 5-10% each month. Sure, you’re winning up to 100% of your trades, but if you want to turn a tiny sum into thousands, it’s near impossible to do it selling options. 10% of $500 is just $50. That’ll buy you a couple of steaks for a night out, but hold the wine. You need a larger portfolio and usually approval to trade on margin. Selling options is a strategy I recommend and teach my readers. I’m not saying don’t do it. But buying options the right way gives you an opportunity to pocket triple digit profits in a short amount of time, with little money, and no margin approval required. You can’t get the huge gains selling. Let’s took a closer look. I showed you how following my trades and having impeccable timing, it would’ve been possible to turn $500 into over $678,906 in under 10 months. But, like I said, nothing is ‘get rich quick.’ We’ll always have losing trades. Even if you only trade a few of my recommendations, I’m going to bet you’d still be happy with the results. Like when I recommended a GLD option. In a mere 23 days, it shot up 127%. Let’s say you had $500 spread out among your stashed cash and some loose change in the kitchen drawer. In less than a month, you’d walk away with $1,135. Amount of time to do this…10 minutes maybe. And that’s pushing it. Let’s say you took that $1,135 and put it into another easy option play I recommended to readers. Square. The growing payment processor disrupting credit card companies. In just 28 days, you could’ve turned your new ‘extra cash’ balance into $2,814. TLT — a bond ETF — pays a small 2.5% dividend. If you started with $500, in 10 years, you’d capture $125 in dividends. Inflation would eat you alive. Instead, if you traded the option play I recommended, you could’ve pocketed 213% in 30 days. Instead of $125 in 10 years, how about $1,065 profits in 30 days. See, you don’t need much to start. You don’t need to risk your life savings or sell off your 401(k). Buying options lets you start small. Every time you get change at the grocery store. Put it into your options account. Go on and spend some. Then, trade some. That’s all possible to start now. I’m even GUARANTEEING you will 5X your investment today or I pay you. That’s how confident I am that anyone can do this. I’ll show you the four trades to make, everything in just a moment. But perhaps even more important than the strategies are the RULES to follow. These RULES keep us focused and prevent you from trading with your emotions. Making emotional trades is the single easiest way to lose money in the markets. And with options, it’s easy to let your emotions get in the way. That’s why many gurus out there recommend to stay away. I believe you can safely ball that advice up in your head and chuck it in the trash. Because you can guarantee your emotions will never get in the way if you follow a strict options trading formula based on RULES. However, I must add this disclaimer: trade options at your own risk if you ignore these RULES. I briefly touched on this earlier. When stocks go up 7%, your options can go up 127%. That’s what happened with my GLD recommendation. As you can imagine, the flip side is true as well. That’s why you must…without exception…limit your downside. Managing your risk means keeping a tight lid on a trade when it doesn’t go your way. Pretty small losses compared to the upside. One winning trade for 127% in 23 days not only makes you money, but even if you trade all six of the losing trades I just showed you, it still makes money. You don’t even need 50% of your trades to be successful! Buying options gives you limited downside, with an unlimited upside. Preserving capital is how you get to fight another day. I’ll teach you how to hold on tight to your capital while also allowing enough breathing room for your option to soar in price. If this is your first time digging into options, it may take a while to find your style. What I mean is that you may find you do better trading one strategy or another. Or, you’re better off trading ETFs than individual stocks. Again, push *ignore* on that advice. I believe there is no one perfect strategy with options. Options are flexible. There are so many things you can do with them. I have four strategies to show you and that’s just for buying options. There are a ton of strategies for selling, for hedging your portfolio, creating income, the list goes on. Options excite me because there’s so much to do with them. I hear about new strategies all the time and I’ve been doing this since the 90’s! You won’t ever hear a lecture from me about ‘my way or the highway.’ If you find a way to trade that makes you money, do it. However, I may break that rule just a touch with this last rule. As a Market Maker on the floor of the CBOE, I had a ‘behind the scenes’ look at the options market. Think of it like you’re at the doctor’s office. He puts that massive eye mask on you and flashes some letters and numbers on the wall. Sometimes, the images are fuzzy but you can still make it out. Others are as clear as daylight. That’s how it is when you trade on the floor. Other traders outside the CBOE can see a little, but they don’t get the full picture. Here’s the secret to how institutions trade options. Those outside of Wall Street use fundamental and technical analysis to find opportunities and then look at the options last. Institutions do the exact opposite! They look at what options are ‘on sale’ and then look at the fundamental and technical analysis last. Compare it to how one might go about investing in art pieces. Odd example, but let me explain. Most gurus would approach art buying by first looking at what’s hot now, finding those art pieces, then determining if the price is worth it. They hope to catch the price at the right moment where it still goes up and they profit. If they’re wrong, they could lose a ton of money if the piece goes out of style and plummets in value. That’s how most gurus approach buying options. Look at a hot option then determine if the price is right. Only after finding those art pieces do we look at the broad market to see if this piece will ever become valuable again. If we are wrong… we bought the art on sale and don’t lose much. If we are right… we could reap double, triple-digit maybe higher profits when the piece becomes valuable again. We’re trying to ‘buy low and sell high’, while most option buyers are trying to ‘time the market.’. It’s your choice what you’d rather do. If you’re interested, I’ll show you how to find these ‘mispriced options’ right now. I can show you how to get around this right now. The Extra Cash Masterclass for Options. This video walks you step-by-step how to begin trading options. If you’ve traded options before, I bet you will still find something new to learn. I’ll also walk you through my top four buying options strategies. You’ll get all this inside The Extra Cash Masterclass for Options. This class alone could retail for $199. As a bonus add-on, I want to also include my special report, 7 Reasons Options Traders Fail (and 11 Ways to Help) . This is a perfect complement to the masterclass to help you get off the line faster than most beginners. In total, both the masterclass and your special report would go for $249. However, since you’re using just your spare dollars for the trades we will make, I don’t want to charge you a penny for this series. And you’re getting this information from someone who knows the inner workers of the options market. Again, my name is Jay Soloff. “Mr. Options” as one fund manager called me. You’re not only getting 21 years of options experience packed into this brand new masterclass…. Plus, all the tips and strategies I pick up from hedge fund managers, professional traders, and my entire network. However, I don’t want to leave any stone unturned. I want to help you every step of the way including where to find the extra cash to start. That’s why I have another special bonus report. 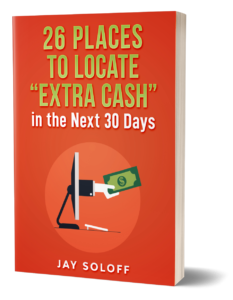 26 Places to Locate “Extra Cash” in the Next 30 Days. And that’s only 5 of them. I have many more inside this special briefing. If you’ve already looked in the seat cushions for cash, this special report could hand-deliver you the capital to start trading. Imagine finding $100’s of dollars all over your house and on online. It’s there for the taking. Just last night, my friend found $60 in a messy closet he didn’t know he had. Because you can then turn all that newfound money into potentially thousands, tens of thousands, even hundreds of thousands. I showed you how it’s possible to turn that $500 into over $678,906. That’s obviously a best case scenario. No matter what, Just a few of these trades would turn into thousands. You can see how it’s possible to turn a small stake…extra cash lying around your house…into a surprise small fortune. That’s without touching your 401(k) or IRA or your Social Security. This is just a hobby you can start off with. And you don’t need to spend more than one hour per month doing it. Because I want to make this as easy as possible for you. This premium newsletter is your entry point to your first profitable option trades. You’ll be using strategies I used myself on the floor of the CBOE. You’ll feel like a pro yourself once you start. My goal for this breakthrough publication is simple —> take you from a beginner option trader with a small account and grow it to a larger account. Every month, I will have at least TWO trades for you. We’re aiming at growing our account fast, so we won’t be selling options for income. Only buying. Everything will be shown to you inside the The Extra Cash Masterclass for Options in terms of “how” to make the trade. With your two trades per month, there will be a TON of education. I’ll tell you the ‘whats’ and ‘whys’ of the trade, plus the strategy we will use. There will be four strategies we pick from. Those are outlined in the Masterclass. 2 Educational Write-ups with Each Trade: Not only will I show you ‘what’ to trade, but I’ll also explain the thought behind each. This gets you onto the fast track of being an experienced trader without doing all the research yourself. In total, you’ll be getting $597 of value. 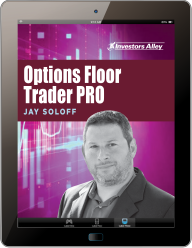 However, a 1-year pass to Options Floor Trader PRO only retails for $199 per year. But, because you’re one of the Charter PRO Members to this service, you’re about to get a massive discount. Already, this service is well below the market rate for options services. I promise if you look across the entire financial publication spectrum, you’ll find most options trading services retailing for $2000… even $3,000 per year. That’s not doable if you’re just getting started. That’s why I created this one-of-a-kind publication. You can get your feet wet with options without stealing funds from your stock portfolio. You only need a few hundred bucks to get started and be successful. “I’ve won about 85% of the trades.. So your service has been a great learning tool for me and my trading. And when you become a Charter PRO Member, you become my top priority. If I fail at this, it will hurt the publication for years if not decades to come. So, the pressure is on. But all the risk is on my shoulders, not yours. Because I’m offering an unprecedented DOUBLE Guarantee for you being a Charter PRO Member. If in the next 12 months, you aren’t 100% satisfied with my work. Meaning, you don’t believe I can deliver double digit and triple digit gains regularly, then I will give you a full refund of your entire purchase. That’s right. If after 364 days, you don’t think the 24 trades you get and education package was worth its weight in gold, call up my team and get a full refund. No questions asked. You can even keep the $597 of value as a thanks. However, that’s not enough for this special launch. I also want to put my entire reputation on the line. Meaning, I’m going to make you a performance guarantee. A 5X Guarantee. If in the next 12 months, you aren’t served an opportunity to 5X your investment in Options Floor Trader PRO today, then you will get a $100 check written to you from me personally. Because the price for a 1-year subscription as a Charter Member today is only $49. Meaning, I will double your investment today if I don’t give you an opportunity to 5X your $49 investment. I’m so serious, I’ll even be trading with my money too a few of my recommendations. I eat my own cooking. This 5X guarantee is one you’ll find nowhere else. Because I opened this publication for someone like you. Someone who wants more money without risking their portfolio and life savings. This is a simple way to take extra cash and turn it into thousands if not tens of thousands. Of course, you can try and do this all yourself. FYI, many of the top option books go for $30 – $50 bucks. Lawrence McMillan’s options books is hailed as “the top options book for 2018” by Benzinga. And he’s not there to help you every single trade. That’s the problem with trying to do it alone. With options, if you don’t know what you’re doing, you could see disastrous results. I’ve given you my top 3 rules which can guide you, but they won’t show you what to trade. I’m teaching you…giving you the trades…and helping you for the same price as his book! That’s important when starting out. I’m not only going to help you with the education, but also show you the trades to make. It’s something I wish I had when I first started trading on the CBOE floor. I started Options Floor Trader PRO to be that ‘something’ I wish I had. Click the button below to get started. You’ll be transferred to a secure page to fill in your information. I have 2 more bonuses to show you on the next page. Start turning your extra cash into real money to spend. Become a PRO member right now.